Volvo 164 Car Battery Replacement at your home or office. Volvo 164 Car Battery Replacement costs $211 on average. What are car batteries and how do they work? A car battery is an energy storage device that relies on a chemical reaction within the battery to produce electricity. The stored electrical energy is used to initially operate the starter motor, ignition system, and fuel system on your vehicle. Once your car engine is running, the alternator supplies the electricity needed for all vehicle systems and charges the battery to replace the electric energy used when starting a car. Most electric vehicles have a traction battery which is in addition to the standard 12 volt battery that is used to start the car engine. Traction batteries also convert chemical energy to supply electrical energy but operate at higher voltages and often are monitored by the PCM (Powertrain Control Module). When to replace a car battery? Your car doesn’t start. A new battery has a specified capacity to provide power. This capacity is referred to as the cranking amps rating of the battery. As a battery ages, the actual amps that a battery can supply becomes lower than its original rating Once the cranking amps fall below a critical threshold, it will be difficult or impossible to start your car. Battery or charging system warning light is illuminated. Should a battery or charging system warning light illuminate, a mechanic should perform a few basic tests to determine if a battery replacement is needed. Electrical components don’t work. Once a battery has started to fail, and the voltage produced by the battery drops, then vehicle electrical components can malfunction, such as the security system. If you are experiencing electrical malfunctions, it’s a smart idea to have the battery tested. How do mechanics replace the battery? A temporary power source might be installed to avoid the possibility of losing radio presets or stored data in the PCM while the battery is out. When the battery is already completely dead, this step is unnecessary. The vehicle’s negative cable is removed from the battery, followed by the positive cable. The battery tie down system is loosened and the old battery removed. Cable ends and wiring are carefully inspected to ensure cleanliness and no corrosion. In some cases, corrosion can be extreme and the cable may need to be replaced or wiring repaired. The new battery is installed and the tie down system is reinstalled. Anti-corrosion compound is applied to the battery terminals. The positive terminal is reconnected followed by the negative terminal. Some vehicles, for example some models of BMW, VW, and Audi, may require PCM programming to input battery parameters. This step, performed using a specialized scan tool, is necessary to maximize battery life and prevent electrical system malfunctions. The car is started and charging system output is measured and compared against the factory OEM specification to ensure that the new battery will properly recharge. Generally, charging output will be in the range of 13.8 to 14.8 volts but the exact specifications vary by make and model. Is it safe to drive with a battery problem? Yes, but if you have a weak battery you might be left stranded somewhere if the battery dies completely and you cannot start your car. A faulty battery may also needlessly overload the alternator and could adversely affect the operation of the vehicle’s electrical system, including the vehicle security system and the shift interlock. The quality of the electrical connections to the battery posts is important. Connections must be clean, free of corrosion and properly tightened. Batteries store a large amount of energy and if short-circuited a battery could explode and can create intense discharges that can damage your eyesight. Insulated tools should be used to attach cabling to battery terminals. Otherwise, the battery’s positive cable can be shorted to ground or the positive and negative posts can be directly shorted. Batteries can only be safely installed from a positive terminal to positive wiring and from a negative terminal to body ground. If the polarity is reversed damage will likely occur to the vehicle’s electrical system. Generally, a car battery will have a service life of 4 to 7 years. If a load test on a battery reveals a significant reduction in the capacity of the battery to provide power, you should buy a new battery rather than wait for the old battery to fail completely. Batteries should only be disconnected if the engine is off and the alternator is not running. 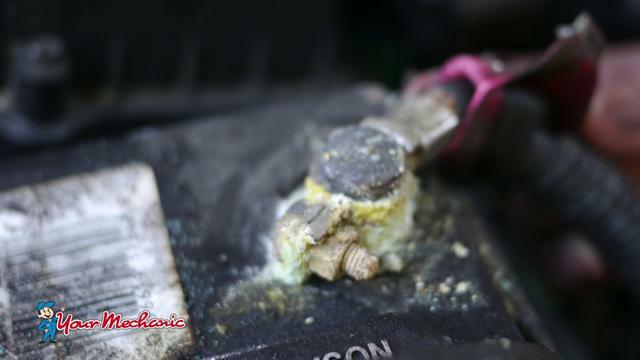 Disconnecting a car battery while the alternator is running can cause a voltage spike that will damage sensitive electronic components in the vehicle, such as the PCM.